No I have not dropped off the face of the earth. 2. The second sleeve has been completed for Otto, which means that I have now completed most of the knitting. 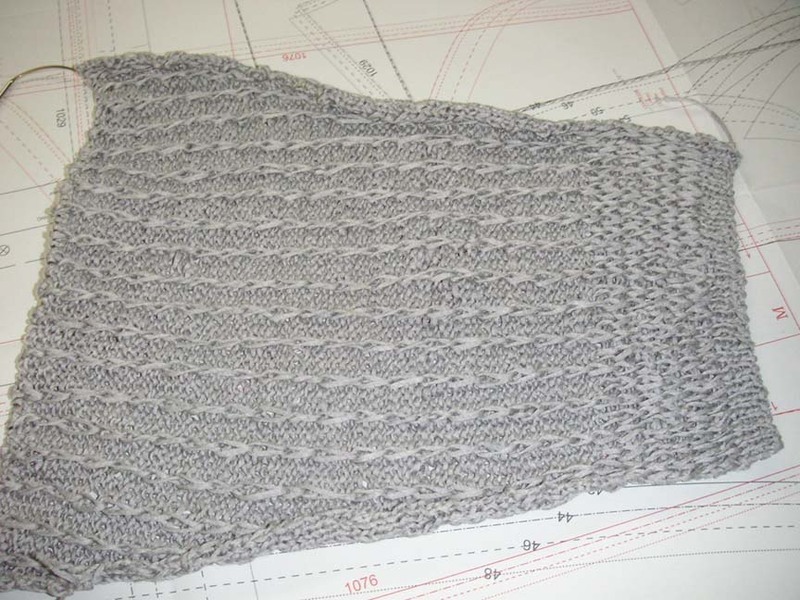 This sleeve needs to be blocked, the sweater must be assembled and the button band must be knitted. I also have to find the right buttons. I shall look at the in-house button supply first hoping to find something there before having to search elsewhere. 3. While searching through the current project box, I was appalled to find that Rogue is still there, knitted and blocked but not assembled. I had forgotten that by the time I finished Rogue it was too late for wear last winter and I suppose I didn't feel like putting it together in the summer. That has to be finished because we will soon be in fall sweater weather. 4. I need to start another project. I have Mermaid which I intend to start but I need to check the calculations and I am not sure that it will be a traveling project, one that I can take to knitting group, or up to Bard to pass the time between concerts. A second project might need to be found as well. How do people manage to get so much done? Is there some essential flaw in my character? Do I not work enough? Do I not devote enough time? Obviously this is true because if I spent more time knitting I would undoubtedly get more done. But where is the time found? I had thought that I would finish Otto by mid July. Here I am in the second week of August and still plugging away. I am not actually bored with the project. I have every intention of spending more time with Otto every day but somehow I never get there, never get settled down with needles in hand. The final sleeve progresses in tiny baby steps. Of course there are other temptations as well, stolen moments curled up with a book, the temptation of other fiberly pursuits. Yes it is true. I have been spending time sewing as well, and cooking and working in the garden a bit. How does one decide which passion is the one to be indulged in any given moment of spare time? Perhaps it would be easier to have but a single hobby. Life, work, a single passion. This could be managed. It will never happen. Well, actually Otto missed the opera, he had to stay in the car. He was glad he did, it was possible he may have drowned had he ventured out. Progress had been spotty at best; at knitting Thursday night I got a lot done only to have to rip about half of it out near the end. At that point it seemed quitting and heading home and to bed were the best options. When I examined the remnants of my first sleeve the next morning, I found I had made another error quite a ways back, before I had started shaping the sleeve cap. I had knitted a row I should have purled, and this was quite a jarring error, and so a major step backwards was required. So I ripped and began furiously reknitting. It is not that I mind knitting sleeves, I really don't, but by the time I get to the sleeves, especially in a sport weight sweater, I am ready to move on to something else. I have considered knitting sleeves first, but then the same thing happens only I am knitting the front or the back and it is no more encouraging, often less so simply because it is bigger and harder to get through when my mind is wishing to race ever onward. Luckily we had planned a trip up to Tanglewood on Friday and I had a nice stretch of car time to put to use knitting. It went well, with no errors this round. By the time we arrived I was well into the shaping at the top of the sleeve cap. I have long wanted to attend the Festival of Contemporary Music at Tanglewood, but for quite a few years it was always held one of the middle weekends of August, the same weekends as the Bard Music Festival and so we were never able to make it up to Tanglewood. This year however, it is earlier, and I was eager to hear something. G thought a whole weekend of modern music might be a bit much, and he is probably quite right, as we have two music packed weekends awaiting us next month and three music intense weekends in a month's time is probably more than even I can bear. But this first concert, a program of three short Twentieth-Century Operas sounded very interesting and the concert was lovely and great fun. The performances were spectacular, the staging was witty and charming and everything was lovely. My favorite was "There and Back" by Hindemith because it was just so charming and witty and fun. The staging was a gas, the singing was exceptional, and frankly I don't remember the music much, it seemed to follow the story but not stand out on its own. That is neither criticism or recommendation, just that it didn't stand out for me. Odd, because I usually love Hindemith and have done so since I was first introduced to his music in college. The second work was by Stravinsky, "Mavra" and the music was much more forward and present in this opera. The music shaped the settings and the scenes, although there was also a lot of wit and a bit of kitch thrown in. Some of the songs were positively beautiful. The first two operas were light and witty, certainly not serious ponderous works. The same cannot be said exactly for the last work by Elliot Carter, called "What Next". Now both G and I were uncertain that we would like the Carter as neither one of has ever developed a feel for his music. It was a strange and difficult piece and there the rhythms could be very difficult to discern. It could not have been easy singing. I might have enjoyed it more had I understood the words better, they were in English, but I had trouble making out the actual words. This could have also be because the heavens had opened and there was a deluge outside the concert hall during much of this work. It did make me think that perhaps I should try listening to Carter's works for voice as opposed to the instrumental works, which I have not found inspiring. It was still raining when we left the concert and the first parking lot, the one closer to the gates, was deeply flooded. Upon arrival G had complained that we had to park so far, but this proved to be a lucky thing as we were high, on gravel. The first lot was completely flooded and there were cars so deep in water that the water came up past the wheel wells and over the bottoms of the doors. We had to walk through the rain but we the car was at least dry. Lenox is also home to a wonderful yarn store, Colorful Stitches, and G offered to take me there after we left Tanglewood. Of course I agreed. The first thing we saw upon entering the store was Hanne Falkenberg's Mermaid in the gray and pink colorway. Now I have been intending to order this kit but I hadn't gotten around to it, and I had been torn between this colorway, #6 and colorway #8. I was afraid that this would be too pale, but it is not, or that #8 would be too bright. I don't know about #8 because it was not in the store, but this would be perfect for me. Also, G saw the sweater and said "you must knit that", followed by some comment about an anniversary coming up next week (the anniversary of the day we met), and the kit was a done deal. They had lots of other beautiful yarns, but not the specific things I had in mind. My brain was still all wrapped up in the music and the opera sets and I was really having trouble changing my stream of thought from music to yarn so I was somewhat overwhelmed in the store. I suppose G should keep that in mind, take me yarn shopping after a fabulous musical experience and I will exit with fewer bags of yarn. Hmm. I don't think I'll point that out to him. Perhaps he hasn't made the connection. So this will probably be the next project on the list when I finish Otto. I might intersperse a few quicker knits; but then I may just become obsessed. Meanwhile, I ripped through the rest of the first sleeve and got it on the blocking board last night. It looks like it will work out well. The last sleeve has been started. What is it about music that makes the knitting go easily whereas at other times my mind might wander interminably away much to the detriment of even the simplest pattern repeat? The sleeve of Otto was ripped yet again, but not completely this time. Apparently knitting and talking are not always good companions. 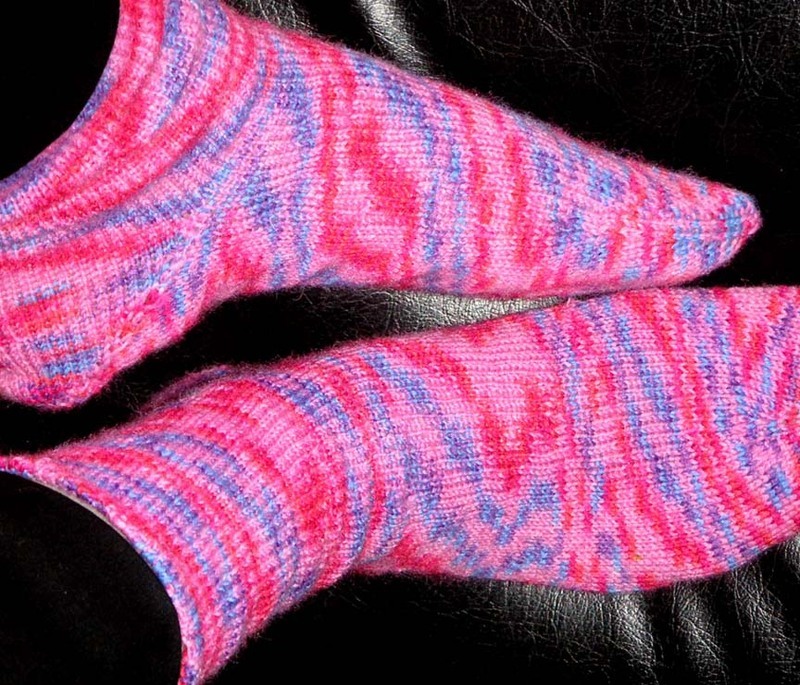 The solution may be just to find something simpler to knit during Thursday knitting: finishing a sock perhaps? And yet the first error did not occur due to the distractions of conversation but during the viewing of television. Now I know perfectly well that I don’t really watch televison with rapt attention; I never have. This is why I need something to do with my hands while I am present in front of the TV, so that I remain there, a captive audience, for otherwise I would usually wander off entirely. 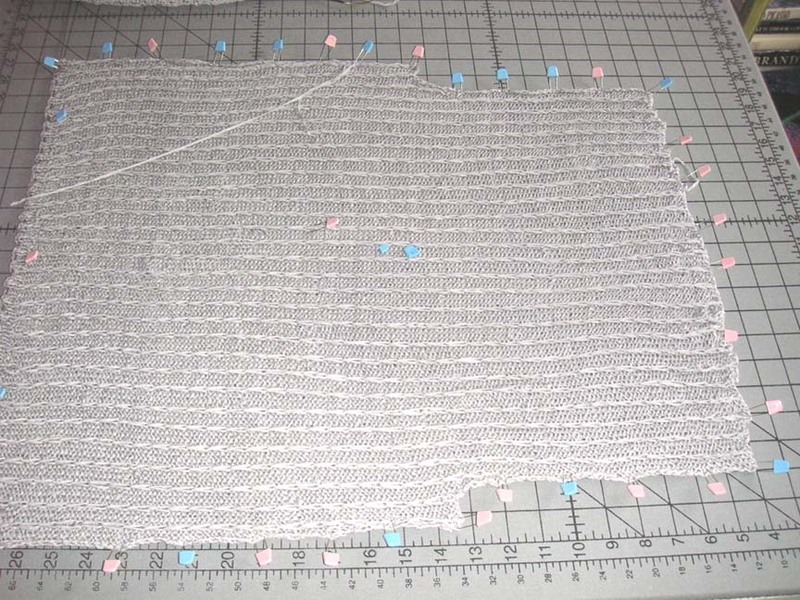 And I do not believe that I was so raptly involved in Project Runway that my mind was not capable of a simple 2 stitch repeat; but apparently involved in something other than the TV and my knitting. At any rate I managed to rip about six rows of Otto just before the concert began and get the stitches back on the needle in an orderly fashion. Luckily I had my sock with me in the car, as I could not have ripped and picked up those stitches on the bumpy Taconic. This time the pattern took and actual progress was made. I love knitting during concerts although I have, at times, had my issues with Knitting in Public, and guilt, usually brought about by comments from other concert-goers. I do not knit in all concerts. 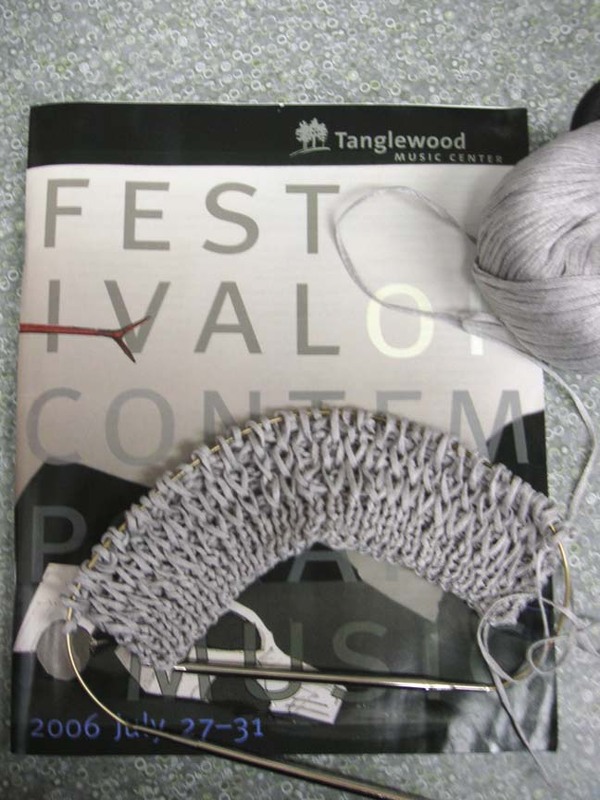 I did not knit at Tanglewood three weeks ago, although I had my knitting with me. It could be because we purchased our tickets late and were literally at the feet of the Juilliard Quartet, and as I stared up at the performers I felt like an acolyte rapt at their feet. I watched the bowing of the violin and viola, I stole glances at the music as they progressed through the work. I watched fingers move, and the subtle tapping of feet, all this as I was carried away by the music. Saturday night was a different kind of concert; not that the music was less than beautiful, or that my mind was not engaged, but more that I was there, one among hundreds in uncomfortable seats and although I loved the concert, sitting still has always been a difficulty. By engaging my hands I seem to free my mind to enjoy the music, to soar with it, and to pay more attention. Otherwise, no matter how beautiful the music my mind wanders, I start to fidget. I think about how my back aches, or my leg wants to move, or just how soon before I can stand up and go “over there”. I look at the other audience members and admire how they sit so still, so rapt with attention – or are they really thinking about Johnny’s little league game that afternoon? You would never know to look at them. 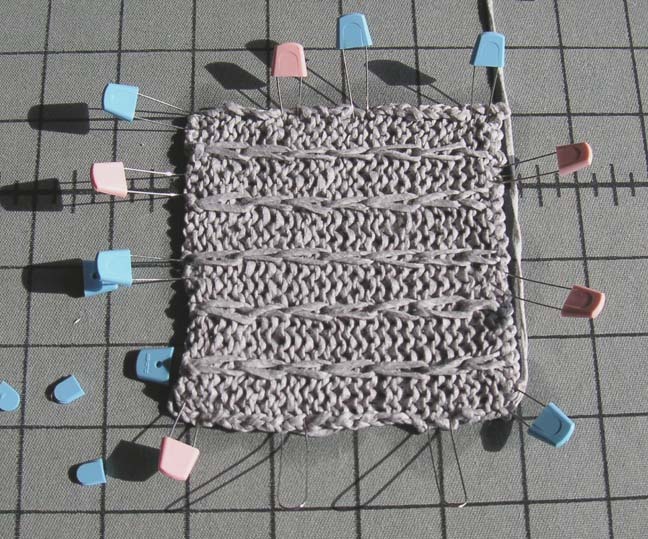 But no one ever managed to train the fidget out of me, and I look at knitting as controlled fidgeting in many ways. Listening to music soothes my mind and allows me to concentrate on the music and the pattern. There were no errors. The Brahms was wonderful. We heard the German Requiem and it was spectacular. It like it better this way, sung in German. The German is poetic with the music. You don’t need to read the texts to enjoy the music; sometimes I feel that I lose the detail of the moment if I am reading the text to closely. But knitting is different; it allows the mind to soar with the music. My hands work steadily, if perhaps a bit slower at times than in other circumstances, slowed by the rhythm of the music, the passion of the surrounding sound. While I don’t believe that knitting picks up the spirit of the place or time when it was being knitted. Knitting remains inanimate. I do however, remember where I was with each knitted piece that was knitted at a concert or on a trip; the sweater is a reminder, for me far more reliable and evocative than photos or words, reminding me of where I was and what I saw and what I heard. Perhaps I should be listening to music while I knit rather than watching TV. Well that will have to wait, as the stereo system is still down while the woofers are being rebuilt. The house is limited to the sounds of conversation or the television rambling on and on. Yesterday was a quiet day of sorts; thunder off and on, rain eventually, which was good because I had been hoping that I would not have to go out and water. There must have been lightening or some other problems because the phones were wonky, going dead occasinoally, or getting sharp sounds and then going dead, sometimes even a little electrical static. It seemed like a good day to do simple things. An old foot problem that flares up occasionally bothered me a little bit yesterday following a flare-up last week so I thought it best to stay off my feet. With the telephone problems it seemed best to stay out of the office, and for safe measure, off the sewing machines as well, even though they are all plugged into surge protectors and uninterruptible power supplies. I could hear the devices chirping and beeping all day as the electricity fluctuated. I started the first sleeve during Project Runway last night. Actually the first time I started the sleeve, I just cast on and started knitting, without thinking. It didn't take long before I realized the sleeve looked huge, and I ripped it back out. My gauge was spot on. I often wonder why patterns make sleeves so big at the wrist. I like mine fairly close; perhaps it is I who am off in my preferences. The pattern apparently expected the sleeve cuff to be about 12 1/2 inches around, far far to large for me. I redid it at 9 inches, perfectly comfortable around my wrist and with adequate room to get my hands through. Of course I will have to recalculate the increases so that I end up with the right number of stitches by the time I reach the armscye and before I begin the sleeve cap shaping, but that should not be difficult. I'll be ready to start the main body of the sleeve, and the increases, tonight at knitting group/class. I am eager for knitting time, at least whenever my hands are not sticky from the heat, or I am not running around repositioning buckets to stop the drips raining down around the chimney. The roof will get fixed next time it is sunny long enough for things to dry out. The leaks are marked and the problem assessed. To many men and too much brick and concrete sat on my shingled roof for there to be no problems. 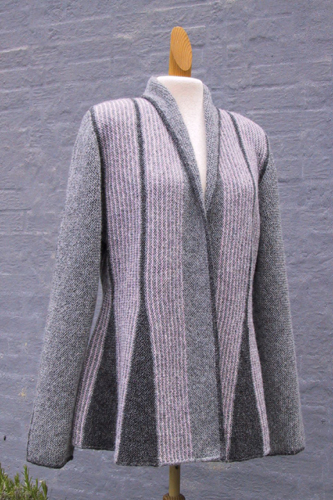 The pattern I am using for the Jaeger Albany cardigan is called Otto. It is not, what naturally comes to mind when I think of the name Otto, however, and I am wondering about the thought process of the designer. There seems to be some intellectual or cultural differences in thought processes going on here, or just associations of which I am unaware, Still Otto it is. At roughly an inch a day, and considering that I have not knitted since Thursday, perhaps early July is an overly ambitious target. I will hope to improve. Still, the pattern is simple and almost mindless, although there was a brief period at Thursday's knitting group when I seemed incapable of counting to 4. The yarn is a pleasure to knit. I wish I had knit this sooner and purchased more of this yarn when it was still available. But then, it seems that every project I knit makes me think of other things I could knit with whatever yarn I happen to have running through my fingers at that moment. The possibilities are endless. But there are always new yarns, and new ideas, and not enough hours in the day. And I have managed to create a swatch for my next project although I have made no progress sewing up the two waiting in the wings. The yarn is Jaeger's Albany cotton ribbon in shade # 262. It is destined to be this sweater from Jaeger brochure JB11.